Gotta have climate control (I have the outdoor work shop wired. But cost to insulate, heat, A/C etc is just not justifiable. I can get heat and a/c in the garage no problem by opening the door to the inside of the house. In talking to other builders who have external workshops they all said the same thing. "The closer you can get to the house, ie. basement, garage ect. , the more time you will spend in it and the closer your family will feel to you when you work. Once a suitable place is selected, you will need to make sure you have adequate ventilation, lighting, power, and space. The first thing I did to the inside of my garage was to paint it glossy white. You want things bright, and well, mine needed painting anyway. Making it glossy gives a great reflective surface and makes it easier to clean. 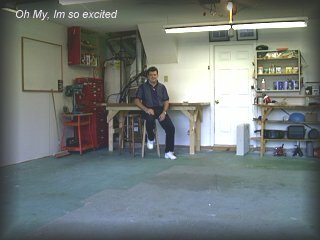 Then I plumbed it w/ PVC for the pneumatic tools, ran some lights, and built a couple of benches out of doors and 2x4's. BTW, a door makes a great bench top. Use a solid core door for your main working area and if you have the space, use a hollow core (cheaper) for laying out plans, and general storage.